I started working at Align 4 Life in March 2017 and it was only when I joined the team and attended the Spine and Nervous System Presentation that I truly understood chiropractic and the benefits it can bring. 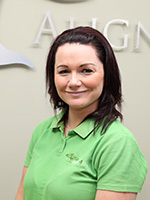 I feel working at Align 4 Life has changed my life and, receiving care myself, I feel healthier than I have been before. People associate chiropractic with neck and back pain, but it is so much more than that; it is how your body functions from the inside, a healthy spine = a healthy mind. I have always had a passion for health and fitness which started at an early age and included hockey, badminton, and netball. I have always been so intrigued by how the human body works so I decided to pursue a career in health and fitness leading to a qualification in personal training and fitness instruction. From this I went on to work in mental health as a physical activity coordinator to help clients relieve mental illness though exercise and good nutrition. I love and enjoy every aspect of my job and I feel privileged to be working alongside the other members of the team. It is very rewarding seeing a client get well and be able to live a happy life without pain.